Omega Woman is an exceptional quality product recommended by doctors and health care practitioners as part of a regime to ease hormonal symptoms such as PMS, mood swings, and related skin afflictions. 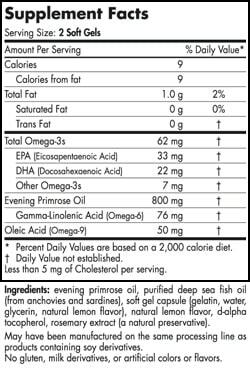 It is comprised of GLA from Evening Primrose Oil, as well as DHA and EPA from cold water arctic fish for their synergistic attributes. 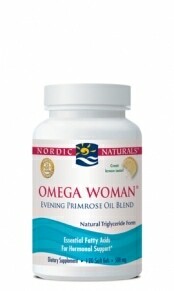 This formula is for all women, from puberty through menopause and beyond. 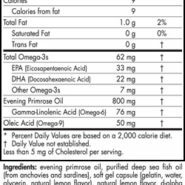 Gamma Linolenic Acid (GLA) is an omega-6 fatty acid (found in Evening Primrose Oil) which is often recommended for use with omega-3s from fish. Ideally, your body manufacures GLA from LA, or linoleic acid, which is found in nuts, seeds, and vegetable oils. Given that the conversion of LA to GLA is often blocked by poor diet, disease, smoking, alcohol consumption, and stress, many people choose to take it in supplement form.